You’ll have to forgive me for being late to the game on Gongfu Bao, but to be fair, its existence as a food cart primarily occurred before I lived in Ottawa, and since its transition to brick-and-mortar, it’s been busy. Really, really busy. To finally try out their delicious-looking steamed bao, my wife and I came on the early side of their evening hours. Arriving just after 6pm, we beat the rush as people flooded in after 6:30, and there soon wasn’t a seat to be had in the small 30-seater in Centretown. You know you’re in for a good meal when there’s a compact menu, and the descriptions make you want to have it all. We landed on the shaoxing pork, braised brisket (both at two for $11) and fried chicken (two for $12) for our bao. We tacked on a couple sides as well; both were intriguing plays on Chinese dishes – turducken siu mai ($8), and a tourtiere eggroll ($7). The Quebecois-Chinois mash-up egg roll came first. It’s been a thing for several years now of putting one type of food into another to make a whole new food. Sometimes it works, sometimes it doesn’t. My old haunts of Halifax have had this occur with everything becoming donair-ed, including egg rolls, soups, donuts and even most recently, cupcakes. A tourtiere egg roll really makes sense though. Some regional styles of egg rolls are already meat heavy, so this cross-cultural pairing makes you wonder how it never happened before! 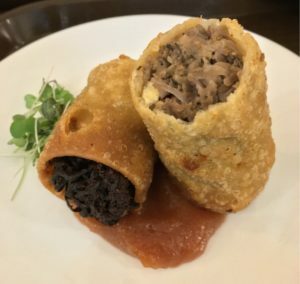 With the added local egg roll style of open ends that get charred in the cooking process, the rich flavours of the venison and beef made for a hearty roll. The crisp wrapper was spot on, and a thick, not-too-sweet plum sauce added a tangy counterpoint to the richness of the meat. However, its price tag puts it more than three times the cost of a typical egg roll in the city, so be prepared for one lone egg roll on your plate – not two or three. I was very curious to see how the turducken siu mai would be, as I had no idea what to expect presentation-wise. For anyone unfamiliar, a turducken is a carnivore’s fever dream of a chicken stuffed into a duck, which is then itself stuffed into a turkey, and then roasted. 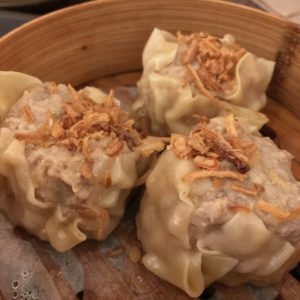 Upon receiving the dumplings, the open-faced siu mai didn’t hint at anything so dramatic, rather it seems that the three different meats were minced together into one delicious dumpling. The meat was tender and juicy, and it was topped with a light sprinkle of crispy onions, but this was a missed opportunity for some fried chicken skin. 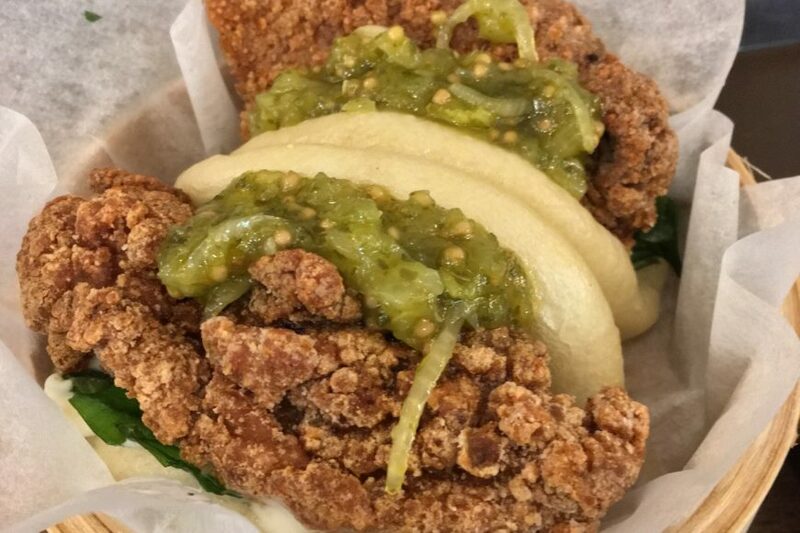 Speaking of fried chicken: the fried chicken bao. These were our clear favourite out of the three steamed buns that we tried. Super crispy, moist and flavourful filets, with basil, mayo, and a lightly tangy gai choy relish, these were wonders for the taste buds. The bread portion of the bao was airy and pleasantly chewy. The beef brisket bao was rich and tender, with a wonderful mix of flavour from strips of pickled lo bok, cilantro and crispy onion bits. It wouldn’t be a Chinese meal without a little heat, which was brought by the spicy long beans on the Shaoxing pork bao. It was enough to let you know it was there, but not so much that you couldn’t appreciate the meat or other food afterward. 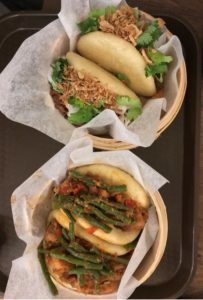 For once, the pictures on Instagram don’t lie – Gongfu Bao is legit, and pumping out some wonderful dishes ranging from their namesake bao to more experimental sides. My best advice for customers is a paraphrase of the joke on voting – come early, come often.